Spiriterra is a small family run producer based in the hills of the Vaca Mountain Range – with vineyards above Lake Hennessey. Husband and wife, Paul and Shirley Dean moved here in 1996 after they took a trip to California to specifically watch the “Big Game” between Stanford and Cal Berkeley (their daughter Ashley was at Stanford at the time). During their visit they drove up to the Napa Valley to do some wine tasting when Paul happened to glance at one of the real estate magazines sitting outside one of the grocery stores. He then called up one of the agents who introduced him to this particular hillside property and by the end of that week the Dean’s had purchased 52 hillside acres. They uprooted themselves from their long time home in Connecticut and moved to the Napa Valley permanently. Several acres of Cabernet Sauvignon were planted on site at the time of their purchase – and for many years they sold the fruit until 2009 when they held back all of this varietal and made their first Cabernet wine. What is the rarest commercially produced grape varietal in Napa? Perhaps it is the Muscadine grape. Paul moved to Georgia at a very young age and grew up on a farm in the small town of Eatonton (today just over 6,000 residents) – as one of the late summer traditions he remembers eating Muscadine grapes – both the bronze colored cultivated ones as well as the purple ones growing in the wild. In 2009 he decided to see how Muscadine grows on hillsides in the Napa Valley because he wanted to have fresh grapes of this varietal that he could simply enjoy eating straight from the vine. He planted about 20 vines, was pleased with the results and then planted several blocks entirely to several clones of this varietal. After visiting with hundreds of Napa wineries and producers over the years, a varietal such as this growing in the Napa Valley immediately caught our attention. It is an intriguing varietal for a number of reasons but especially so when no one else is growing it here! 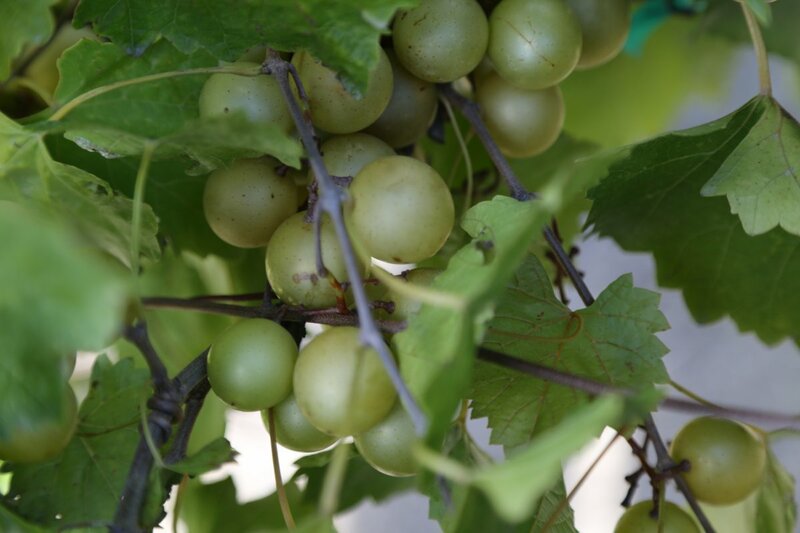 Muscadine is a grapevine native to the southern part of North America that has been grown domestically since the 16th century; the Native American’s were eating them far earlier than that. 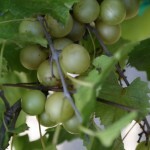 The Muscadine grows naturally at a latitude in the Eastern USA from about West Virginia and Delaware all the way through the southern states as far west as Texas. Paul purchased all the cuttings from a nursery in Georgia. These grapes grow on their own rootstock (not grafted) and are highly resistant to pests. They do not spray for pests or spray sulfur – and in nearly 20 years they have never had a problem with frost on their property during the growing season. They are located at an elevation of approximately 700-800 feet above sea level. The roots grow very shallow on the Muscadine vines – and as a result, they have installed a special 4-drip per vine irrigation system. Paul keeps a close eye on the development of the Muscadine vines and helps with the vineyard management. During a visit to the property in Fall we walked the vineyard with both Ashley and Paul and sampled the grapes. You know this is not a “normal” variety of grape planted in Napa Valley as soon as you see the fruit on the vines. These are the size of table grapes and often much larger. 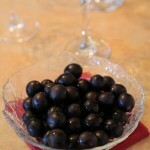 Muscadine has a surprising diversity of flavor depending on the ripeness of each individual grape. At times they taste like a plum, some have flavor characteristics of a concord grape and others that are extremely ripe almost have a jammy quality. The skins are very thick, chewy and contain plenty of flavor and are rich in poly-phenols and other nutrients. In any case, these are extremely flavorful grapes and are highly addictive. This vineyard is also unique in Napa based on the wide row and vine spacing and of course simply the by fact that it is planted to Muscadine. 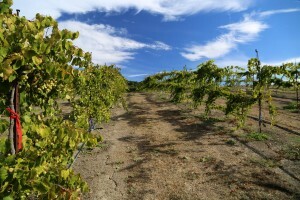 The vineyard was originally planted with the vines 20 feet apart, and then additional vines were later introduced so the spacing between the vines is now ten feet apart. This lets Paul easily drive a tractor between the rows. Also one self-fertile Muscadine vine is typically planted along with 2-3 female plants in order to fertilize the female plants. Picking the fruit is not like any other vineyard in Napa. 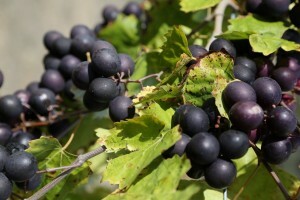 They don’t simply cut the bunches at the base of the stem, because there are generally few bunches – these grapes often grow in quantities of just several together. During harvest they go vine by vine and hand pick each berry selectively based on its ripeness. Their is no “fruit zone” – the way they have the vines trellised means you have to examine all parts of the canopy for the ripe grapes. When the fruit becomes extra ripe, the grapes simply fall to the ground rather than shrivel on the vine. Perhaps genetically inherent in this variety is how the grapes ripen – and is represented in a number of their clones. The grapes do not all ripen evenly – as a result they pick the fruit many times during the length of harvest – selectively choosing only the ripe grapes from each bunch. For example, some clusters will be quite unripe yet there are several grapes within that cluster that are ready to harvest. These Muscadine vines are very much a work in progress – experimental grape growing if you will. They continue to look at optimum trellising techniques, are considering if and how much fruit to drop at certain times during the growing season (these vines are prolific producers even on the hillsides) and other variations in both the vineyard management and wine making. It did not take much to convince their winemaker Kenn Vigoda to work with this varietal. He had never worked with it before – and like other winemakers in the valley, has made his fair share of Cabernet Sauvignon. This was something “new” and intriguing. The name Spiriterra certainly in part reflects their spirit of experimentation and uniqueness with growing this variety in the Napa Valley. “Terra” is a nod to their respect of the land. During a recent tasting of current releases, the highest alcohol wine was 13.3%. Ken’s philosophy is to create a wine that has both flavor, good acidity, and structure and can either pair well with food when it is young, or if you have the patience, age it for many years. 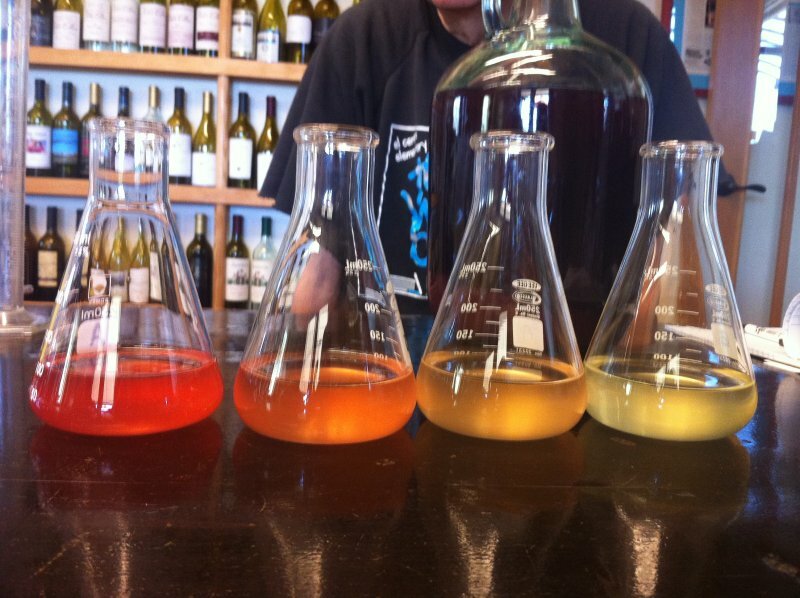 He strives to make balanced wines and is not interested in producing high alcohol high tannin wines. Spiriterra produces two wines from their Muscadine grapes – an almost dry wine and a sweet dessert wine. 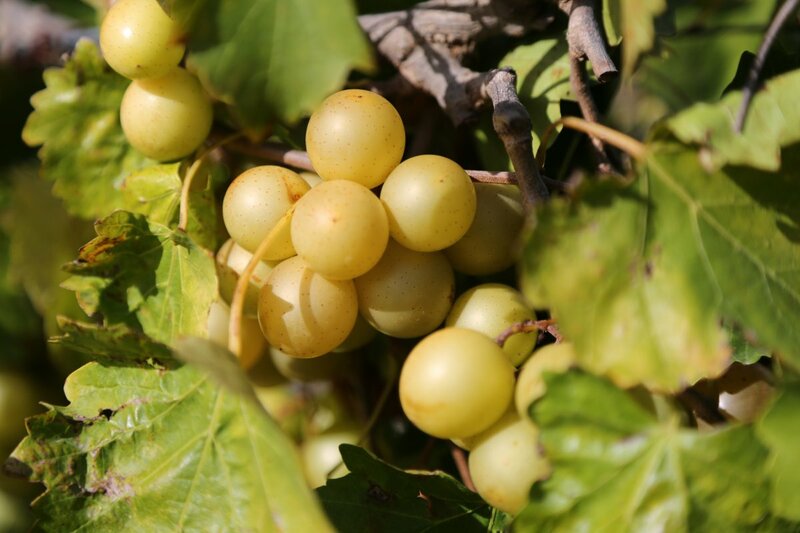 The sweet wine is called “Scuppernong”, which is a name for a Muscadine varietal that originally was found growing wild in part of North Carolina. Eventually this name has become another name for Muscadine grapes – and is associated with sweet wines from this varietal in the South East part of the United States. The 2012 Muscadine has nearly has 1.7% residual sugar but is not noticeable on the palate. Muscadine offers aromas that are very distinctive – you smell this from the fresh grapes and also on the bouquet of both this wine and the Scuppernong sweet wine. It is a musk-like smell along with sweet aromas. 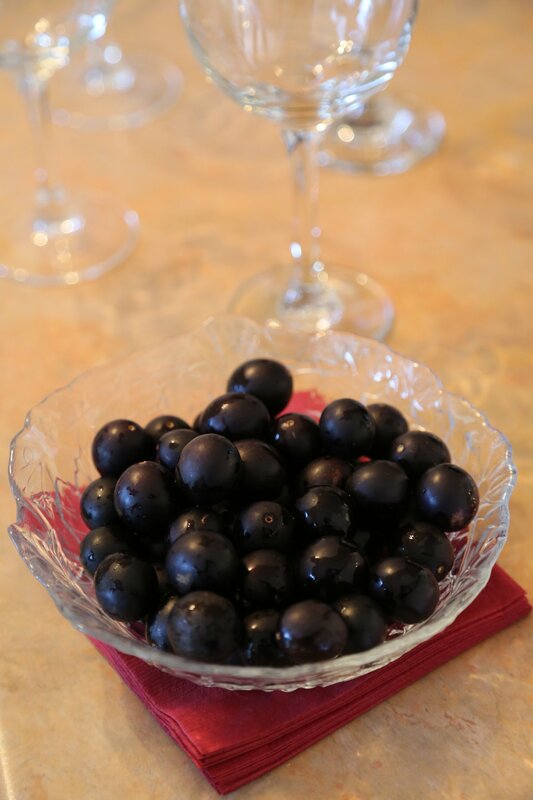 Put some of these ripe grapes in a bag and smell them – you will certainly remember the smell. Additionally, tropical notes show – with nuances of Jolly Rancher candy or bubblegum. The palate is refreshing with a very clean finish. Both of their Muscadine wines were fermented and aged in neutral oak. Their 2012 Scuppernong vintage contains 7% residual sugar and is only 11.6% alcohol. This is a medium bodied wine that is not heavy in structure nor cloyingly sweet. It is a refreshing wine to enjoy on a warm day. The aromas are appealing – brown sugar, tropical, baking spices at at times with nuances of honey. The palate shows tropical flavors and ends smoothly with a very clean finish. 2011 was a difficult vintage in the Napa Valley for a number of producers because of late rain into June (less crop), cooler growing season and early rain that never seemed to go away during harvest. As a result some wineries smaller wineries either have reduced productions or did not make a 2011 vintage. The wines we have tried that seem to have “weathered” this vintage well are some of the hillside vineyards especially on the eastern side of the valley. Their 2011 vintage is 13.3% alcohol and aromatically shows herbal notes – hints of sage and a smokiness along with a tobacco note. As the wine breathes, more fruit shows including red licorice, red cherry, raspberry and eventually some hints of mocha. This is higher toned fruit on the palate with plenty of flavor – red cherry and red currant. Great acidity. Good food wine. Medium bodied. The tannins are well integrated, fine grained and linger along with fruit on the finish for some time. Future plans call for making a rosé from the Muscadine grapes. When your total production is under 200 cases a donation of a barrel to charity is a significant donation. The Dean’s donate at least one barrel each vintage to Roots of Peace – a charity organization that focuses on creating jobs after conflicts that occur in some of the world’s most vulnerable economies. Among one of a number of their missions is the “MINES TO VINES” – identifying regions that contain landmines – removing these and replacing them with grapevines ensuring the locals will have a viable crop.